If you have read Part 1, you would have most likely downloaded your Personal Bazi Chart (PBC). If not, please download your PBC HERE before continue reading. Now if you look at your PBC, you can see that there are four animal signs - one on each of the four pillars. You will also notice that there is a fifth animal sign in the 10-Year Luck Pillar. (This 10-Year Luck Pillar is located right below the 4 Pillars of Destiny). The current 10-year pillar is also shaded for easy reference. Refer to the diagram below. This is an example of a Bazi Chart downloaded from Joey Yap's site. I have circled all 5 animal signs in red. In the above example, this person is born in the year of Ox, month of Rooster, day of Dog and hour of Goat. He is born in 1985, which means he is currently 32 years old and therefore he is residing in the Year Pillar between age 24 and 34. As you can see, the animal sign in that pillar is Horse. Now look at your own PBC. Can you locate all your five animal signs? As you already know, the Bazi Chart is divided into 4 pillars - the Year, the Month, the Day and the Hour. The Year pillar represents your job, career, friends and social network. The Month pillar represents your work performance and business opportunities. The Day pillar represents relationships and your spouse. (If not married, the Day pillar represents you). The Hour pillar represents your children, your ambitions, goals, dreams and also investment opportunities. If the animal sign in your Year Pillar is favourable in 2017, this means you can move forward in your career. Or you can probably build lots of followers in Facebook for example, since the Year Pillar is also related to social network. If the animal sign in your Month Pillar is favourable in 2017, this means you can go to next level in your job. It also means that it is a good year to start a business. The same goes with the Day and Hour pillars - in short, you have to see which animal is in your chart and where they are located so that you can then relate to the different aspects of your life. As for the animal sign in the 10-Year Luck Pillar, this represents whatever good or bad luck will come to you. Just be aware and accept them when they come. Every year, different stars reside in each of the 12 animal signs. Some of the stars are good stars (auspicious) and others not so good (inauspicious). Below is a shot I took during the seminar (Sorry not very clear). It features the 2017 Animal Sign Forecast. All Chinese astrologers worldwide use this chart, which is also found in the Chinese Tong Shu. All the good stars are in red, while the not so good stars are in black. From the chart, you can see that the Rooster has the most red, so we can generally conclude that the Rooster is the best animal sign for 2017. If you have a Rooster in your PBC, rejoice! However, to know which aspect of your life it is related to, you need to see whether the Rooster is in your Year, Month, Day or Hour pillar. The Monkey and the Snake have zero good stars unfortunately, but Joey Yap said this does not mean people with these two animal signs are guaranteed a bad year. No good stars means no external help, so you simply have to depend on yourself. According to Joey Yap, the Top 5 Animal Signs for 2017 are the Dragon, the Horse, the Rooster, the Rat and the Tiger. Do you have any of these animals in your PBC? If you have all five, this is an excellent year for you! However, according to Joey Yap, even if you have only one of two of these animal signs, you cannot complain that 2017 is a bad year for you as there are opportunities as long as you make the right choices, have a good strategy, or able to change your environment. He said that many people have good luck, it's just that they do not make use of it. Now let's look at some of the stars in various categories and the animal signs they reside in for the year 2017. Found in Tiger, Rat, Horse and Rooster. 1. National Treasure (Tiger) - This star represents an increase in status and salary. If you have this in your chart especially in the Month or Year, your opportunity to increase in ranking, in position and power is there. But you need to take action to make it happen. 2. Moon (Rat) - The moon represents the power or ability or business acumen to think about new business strategy. It also represents mastermind of money and money management. Good for budding entrepreneurs and start ups. Unfortunately, the Moon is not a very aggressive star - people with this star usually think a lot about making money but seldom take action. So make sure to take action if you have Rat in your chart! 3. Treasure (Horse) - In ancient days, the emperor rewards certain general or officer who did a good job for the year in the form of a 'treasure'. Therefore this Treasure star is suited for people who are working for commission, prize money, or sales based on commission. 4. Jade Hall (Rooster) - This star represents increase in assets, value, income and wealth. Also the ability to save money. Hint : If you have these animal signs in your chart, make sure you take action. Otherwise, nothing will happen as wealth do not fall onto your lap! Found in Rat and Horse. 1. Sky Happiness (Rat) - This star represents relationships. If you are single, someone will appear. If you are married, your marriage will be happier. If the Rat appears in the Year pillar, you will be attending lots of weddings. If it appears in the Month pillar, and you are a professional homemaker, you will be contributing happiness to your home and marriage. If it appears in your Day pillar, you suddenly appear very attractive to others this year (lol). If it appears in your Hour pillar, you will receive lots of interesting investment opportunities. Note that having a Rat in your Chart is especially good because you have the Moon and Sky Happiness stars, which means you will have both money and good relationships! 2. Red Matchmaker (Horse) - This star also represents auspicious relationship. If you have this star and you are single, you won't be single for long. Your likeability increase and you attract people in your life. Note that when you are likeable, it also means good for doing business. 3. Salty Pool (Horse) - This is not so auspicious as it attracts unwanted relationships. Short of saying you will become more horny (oops I said it!) you need to be careful and more aware of this star if you are married! 1. Emperor Star (Dragon) - Every year, this star only occupies one of the 12 animal signs. In 2017, it is in the Dragon. An Emperor is always right so with this star, it means you are always right! You will have the ability to raise funds, start a business, and get a license for your product. If the Dragon is in your Year pillar, you can change the environment by changing job, career or business location. If it is in your Month pillar, you can take the next level up in your work and career. If the Dragon is in the Day pillar, you might have a strained marriage, because now your spouse is always right! (lol). If it is in the Hour pillar, all your ambitions and dreams will come true! 2. General Star (Rooster) - Represents power, status and authority. With this star, you are in charge! If you own a business, make sure you make all the important business decisions! If not in business, make sure you take a higher ranking in your career. 3. The Duke's Arrival (Rooster) - This year, the General star comes with the Duke's Arrival. With this star, you will get lots of attention and become popular. Of course, if you are not one who enjoy the limelight, this star will do you no good! 1. Heavenly Yi (Pig) - This star brings good mentor into your life. With this star, try to network more with people of higher ranking. 2. Fortune Virtue (Horse) - This is a prosperity star. You get to enjoy life, have lots of good food and basically gets fat! If the Horse is in your Day pillar, and you are single, it means you will get fat. If you are married, then your spouse is the one who will get fat. Lol. 3. Dragon Virtue (Dragon) - One of the best nobleman stars. You have the ability to resolve challenges and problems. 4. Sun (Dog) - The most powerful nobleman star. You become the helpful person to others. A lot of people will come to you to help solve their problems. Only good if you enjoy helping others! But remember, whoever you help this year, you might get their help in return in future, so it's worth helping. If the Dog is in your Year pillar, a lot of friends will come to you for help. If it is in your Month pillar, you will be helping colleagues at work. If it's in your Day pillar, your spouse will be spending a lot of time helping others, so try to understand (lol). If it's in your Hour pillar, you help others become rich in investment opportunities. So if you are a Fund Manager and you have this star, this is definitely a good year for you! 1. Dragon Virtue (Dragon) - This star is already mentioned above. Note that since this is a problem solving star, it means that you will have lots of problems in 2017 for you to solve. If you don't solve or you feel it's a hassle, you will suffer the consequences. So make sure you solve the problems especially since the Dragon also has the Emperor Star which means you have the ability to solve them! 2. Relief God (Ox) - This star is especially good for solving health problems. Use this opportunity to go for health check up and get the right treatment. This star is also good for getting rid of debt issues, and solving disputes and arguments. Earth Relief (Pig) - Good for moving house, renovation and buying new property. With this star, it will be easier for you to look for a house. Note that if you do not have a Pig in your chart, and you want to buy new property or move house, get help from people who have Pig in their charts! 1. Three Stages (Ox) - This represents increase in ranking one step at a time. Best for step by step career progression or climbing the corporate ladder. 2. Eight Seats (Goat) - This star helps you become famous or popular overnight. If the Goat is in the Year pillar, you might find that you suddenly have lots of friends on Facebook this year. If it is n your Hour pillar, your goals and dreams will receive lots of attention. A great star to have if you are into marketing and business. 1. Elegant Seal (Ox) - good for artists, and those in artistic and creative fields. The downside is you might be weird or eccentric. 2. Intelligent Star (Rooster) - If you have this star, make sure you study new skills, new subjects or acquire knowledge this year. It will be easier to learn new things which may prove beneficial to you in future. The new trend of the young and rich is to get rich in their 20's. This method of getting rich depends a lot on networking and connections online, hence the name social capital. 1. Three Harmony (Snake) - This is a Snake and Rooster combination. Find people with good stars to help you. 2. Sky Horse (Pig) - good for out of country investments, exports and doing overseas business. With this star, you have the ability to market products overseas so you can either travel out of the country to do business or sell products to overseas customers online. 3. Grand Duke Combination (Dragon) - With this Dragon and Rooster combination, you are able to connect with the right people or people with power and authority. 1. Death God (Monkey) - This star represents forgetfulness and absent mindedness. This means if you have the Monkey in your chart, you tend to be very forgetful in 2017. 2. Sky Emptiness (Dog) - This star makes you talk a lot, but nothing happens. Or you have big ideas but they suddenly disappear. If you have this star, better not plan for the whole year (because your plans will likely not happen). Instead plan small every month. 1. Lonesome (Goat) - Best described as lonely at the top. You might be rich and popular, but somehow you feel lonely. 4. Six Horns (Dog) - Offending other people. This usually happens when you are trying to help solve people's problems (since you have the Sun star) but ending up offending others. 2. Yin Sha (Dog) - Offending females. If you are a guy, most likely your ex-girlfriend gives you problems, or you have extra marital issues, or your current relationship becomes hostile. If you are a girl, your female friend backstabs you. 3. Leopard Tail (Goat) - Offending people, by accidentally stepping on their tail. Since you are popular (because of the Eight Seeds star), most likely you attract jealousy. 1. Lesser Consumer (Tiger) - Spend a lot on luxury items, vacations etc. Since Tigers have National Treasure star, they make lots of money but end up spending most of the money this way. A good remedy is to buy more assets. So even if you are destined to spend lots of money in 2017, at least you will be spending money on something that can increase in value. 2. Greater Consumer (Rabbit) - Every year, the animal sign that clashes with the Tai Sui (Grand Duke) has this star. In 2017, it's the Rabbit who will have this unfortunate star. It indicates big expenditure and changes in financial standing. Those with Rabbit in their chart will find that somehow there will be circumstances that will force them to lose money. Note that because Rabbit clashes with the Grand Duke this year, it indicates major changes. If the Rabbit is in your Year pillar, you will have a change of friends or work environment. If it's in your Month pillar, you will experience a change in job, structure of the company where you work at, or even a change of boss. If the Rabbit is in your Day pillar, this indicates a change in relationship. It could be a good thing if you are single as you will be tying the knot. If you are married however, it could mean you or your spouse traveling far and apart from each other, or may even indicate a divorce. If the Rabbit is in your Hour pillar, this indicates a change in your investment, usually means losing your investment. 1. Heavenly Officer Charm (Monkey) - indicated arguing with people and challenges in judicial and legal issues. 2. Blood Knife (Ox) - indicates blockages, cysts, or small injuries. May need to be removed via surgery. 3. Sword Edge (Rooster) - minor cuts, small bleeding. Feeling overwhelmed and confused with all the information about the stars and the animal signs? Perhaps it will be easier if you just focus on the 5 animals signs that you find in your PBC (4 animals in your Bazi four pillars and 1 animal in your 10-Year Luck Pillar). Instead of reading through all the good and bad stars mentioned above, just watch short videos of each of the 5 animal signs you have in your PBC. These videos are prepared and hosted by Joey Yap himself. There are 12 videos overall, each video focusing on one of the 12 animal signs. In each video, Joey explains about the good and bad stars found in the animal sign for 2017. WATCH THE VIDEOS HERE. Now, although these videos are helpful and what you have read in this blog post are informative, do understand that what was taught at the seminar are still general information. 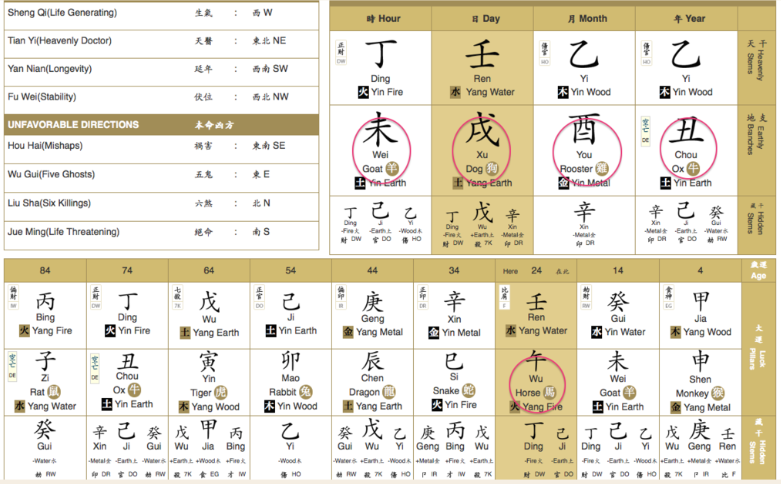 To have an accurate forecast, you need to have your entire Bazi Chart analysed, and not just by looking at the animal signs. If you are interested in a professional Bazi reading with reasonable fee, do email me at mvfblog@gmail.com for full details.